SsangYong has entered the rapidly expanding Nissan Juke segment with the Tivoli, a shockingly good-looking small SUV from the company that brought you the Rodius. It goes on sale July 2015, most likely priced at the low end of the market, meaning a circa-£12,000 starting price. The car is on display at the the Geneva Motor Show. So confident is SsangYong of its new car’s aesthetic credentials that its name comes from an Italian town with a reputation for all things stylish. Initial engines will be of 1.6-litre capacity, petrol and diesel, though SsangYong has only stated the power figure for the petrol, 126PS, with the diesel joining the range later, plus a four-wheel drive option. A six-speed manual is standard, though a six-speed automatic will be offered too. Although UK specification isn’t finalised yet, an adjustable steering system called Smart Steer, which offers Normal, Comfort and Sport modes, is standard fit on Korean cars, while the suspension setup is of the McPherson type at the front, with a torsion beam at the rear. 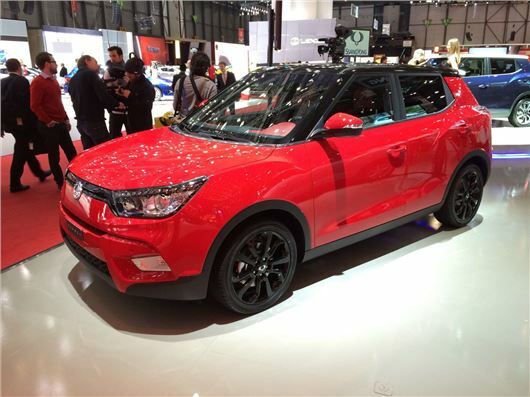 Dual-zone climate control, Bluetooth music streaming, LED ambient lighting, smart key entry and parking assist are just some of the convenience features that the Tivoli will offer.